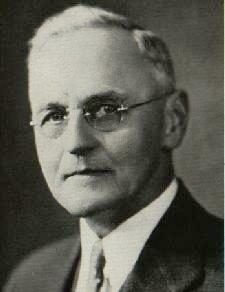 Park F. Yengling, a resident of Bay Village, Ohio, was elected Commander-in-Chief of the Sons of Union Veterans of the Civil War (SUVCW) at the 67th Annual Encampment at St. Paul, Minnesota in 1933. The prior year Brother Yengling had been the National Patriotic Instructor. He has been a member for more than 25 years at the time of his election(1). Brother Yengling had been Commander of the SUVCW Department of Ohio in 1906. Brother Yengling was a businessman and insurance broker. Early in life he had worked for the Luetkmeyer Hardware Company as a salesman. At the turn of the 20th Century he launched his own hardware business until 1918 when he went into the insurance business. He also was vice-president of the Lorain-Denison Bank(2). Brother Yengling was active in Masonic orders, being twice Patron of the River Chapter, Order of the Eastern Star. He also was a member of Rocky River Lodge and Lake Erie Consistatory(2). In 1931, Brother Yengling ran for Mayor of Bay Village, Ohio. His wife, the former Clara E. Gilchrist, was active in the Daughters of Union Veterans as was his Sister in Law, Winifred Gilchrist. His Father was Corporal David F. Yengling, Company G. 104th Regiment Ohio Volunteer Infantry who entered the service in Salem, Ohio on August 11, 1862 to serve for 3 years. He was promoted to Corporal on August 16, 1862, and was mustered out with his company on June 17, 1865 as a Private(2)(3). PCinC Yengling died at his home at 21419 Kenwood Road, Rocky River, Ohio on March 22, 1950 and was buried beside his wife in Brooklyn Heights Cemetery, Linwood Section, Lot 353(4). 4. Brooklyn Heights Cemetery records.